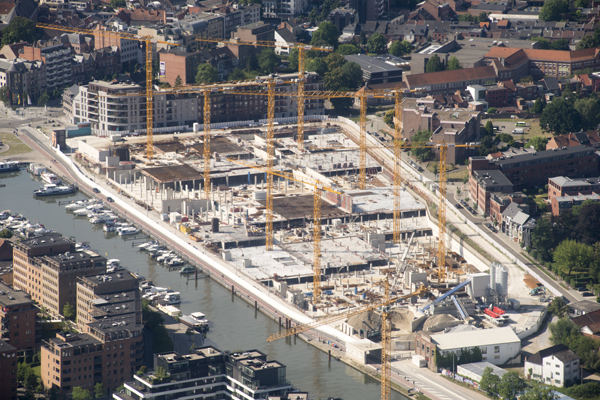 Eight yellow Wolff cranes are being used by contractor Strabag Belgium for the construction of a residential and shopping called “Blue Boulevard” in the marina of Hasselt, Belgium. The crane models used are the Wolff 6015, 6023 and 6031 flat top cranes from the Wolff clear series. “We chose these cranes because they have fewer components and are quicker to assemble than other crane types,” said Dave De Keyser, managing director of Strabag BMTI, the service company of Strabag Belgium. In addition, the maximum load capacities of the cranes from 8.5t to 12t meet the requirements on the construction site, such as the handling of reinforcing steel mesh and concrete skips. With tower heights from 46.1m to 73.5m and jib lengths between 50m and 60m, the Wolff cranes slew effortlessly below each other and do not get in each other’s way when lifting formwork elements and precast concrete components. The assembly of the top-slewing cranes had to be minutely planned and involved two mobile cranes with load capacities of 250t and 400t. Due to limited space on the construction site, the mobile cranes managed the assembly from the road. As a result, traffic was temporarily blocked, which required a special permit from the city administration and the police. 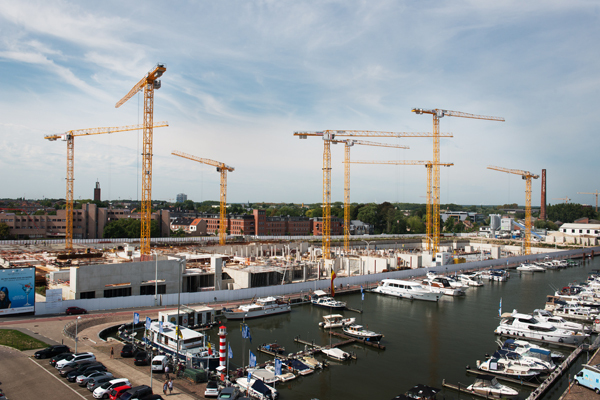 “Since all of the cranes are freestanding, they were anchored in massive concrete foundations. We therefore turned to the two-part Wolff foundation anchor. The spigots for the crane connection can be unscrewed and reused, with only the less expensive anchors remaining in the foundation. We also used a larger tower section of 2.3 x 2.3m for the Wolff 6023.8 clear with a tower height of 73.5m,” said Frédéric Van Hoorebeke, managing director of Wolffkran Belgium. For economic reasons, the cranes were set up in the middle of the construction site, which allowed for the use of cranes with shorter working radii and lower lifting capacities than would have been required if they were placed on the edge of the site. For the dismantling, the mobile cranes will again be set up at the edge of the construction site.